Today’s SURNAME SATURDAY themed post takes a look at the CRISP family of Cambridgeshire, and unravels an old family story. Today’s Surname Saturday theme follows the CRISP family, and it’s also home to one of the earliest verbal family stories that I ever heard in my research, some 19 years back. “Your great great great grandmother was married to a Mr Crisp. They had a son, and then Mr Crisp died. She remarried to your great great great Martin grandfather, and that’s where we descend from. Fairly vague, and probably not an uncommon style of storytelling of family rumours. But, there’s some interesting story details in there, and considering that this would have happened so long ago, it’s interesting to see that it survived into living memory.. so there must be something in it, and someone who has reason to believe it, right? Putting it on the back-burner, as it’s a ‘sideline’ family, from whom I don’t descend, I parked it for about 19yrs whilst I focussed on the addiction that is tracing ancestors. I was tidying up some old files again, and a slip of paper summarising the story above fell out. In all those years, the amount of, and types of, records available online has absolutely snowballed, and so i thought that I would casually go rummaging. (Face it, you knew I was going to put that pun down here somewhere). 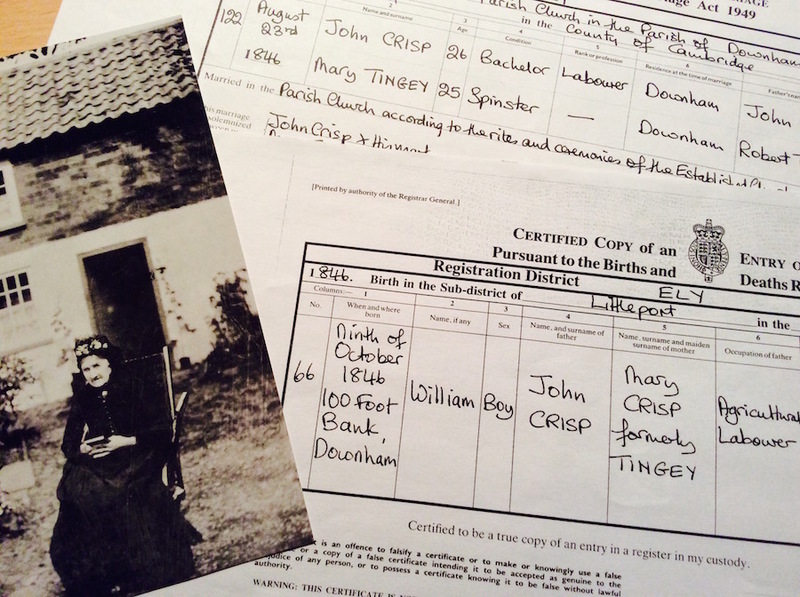 I already had Mr Crisp Jnr’s (William Crisp) birth certificate from 1846, and the marriage and death certificate of his father John Crisp (m: 1846, d: 1847). By July 1850, widow Mary Crisp (née Tingey) had married her second of three husbands – my great great great grandfather – James Martin. William Crisp remains with his mother for the 1851 and 1861 censuses in Little Downham, at the household of his step-father. In fact, the 1861 census lists him as William Martin, rather than William Crisp. Things get rectified by 1871, when his Crisp name is reinstated. Here, he’s living in the fenland parish of Isleham. This village isn’t far from Soham, and is not a parish that any of my other relatives appear to have passed through (hence having not stumbled across him before). With the census found, it told me that he was now 24yrs old, living at Lark Farm Cottage, with his wife Tabitha, and their 2mth old son John (in memory of both of their fathers). A quick dig on Ancestry, and FreeBMD showed that Tabitha was most likely Tabitha Large. Where was the Selina that the story had spoken of? Another census shows the family at the West Bank of River Lark in the parish of Isleham, Cambridgeshire for 1881. William was ’30’, and heading up a family of 6 children (John, James, Rosetta, Eliza Ann, Susan, and Mary) with Tabitha. However, by the 1891 he’s missing, and so is Tabitha. Was this the tragedy with measles? A little further digging, and some of the Crisp children turned up – still living at West Bank, but this time, George Butcher is head of the household, with Tabitha (now Butcher). A young Alfred Butcher is also included in the household, born about 1890. Next stop was the Isleham parish registers to find out what’s been going on. Here, I find that Tabitha Large (confirmed! ), and William Crisp, having married on 20th May 1869 at Isleham parish church, went on to have eight children between 1871 and 1886. FreeBMD notes that William died in in 1886, but Isleham and Soham don’t contain his burial. I shall have to explore this further. His burial did not take place in his native Little Downham, Ely Cemetery, Wicken, Fordham, or a number of other nearby churchyards. Having lost William for now, I continue after Tabitha, but I soon find that she’s missing too… only to find her in 1901, aged 47 years, up at 29 Charles Lane, Milnrow, Lancashire, England. There’s that ‘move up North‘ then. At this time, George is noted a labourer at a Brickyard. Tabitha’s son Isaac Crisp is noted as a ‘Cotton Presser’, Rosetta Crisp as a ‘Woolen Weaver’, Eliza Ann Crisp as a ‘Pattern Card Room Hand’, and Mary Crisp is noted as a ‘Bread Maker’. It’s possible that the children were employed at the nearby Ellenroad Mill. Clearly the mills were putting a roof over the family’s head. By the time of the 1911 census, it’s revealed that Tabitha has had 4 children and that 3 of them died. This must surely refer to her children with George Butcher, but i’ve not yet checked for their names. Whilst I lose George after 1911 (was this the measles? ), Tabitha ends her days back at the aptly named ‘The Traveller’s Rest‘ in Towns End, Soham, Cambridgeshire on 29th June 1921. She was 69 years old. Why was she back there? Well, her second child, James Crisp (known as ‘Jim’) is noted as Publican – presumably of The Traveller’s Rest. He is noted as an executor of her estate. Twenty-five years before Tabitha’s death at James’ pub in Soham, he had walked the aisle on 17th October 1896…. when he married Selina Collen. Selina outlived James (who died in 1944), having raised a family of at least five children with him. So, what turned out to be a snippet of oral history, handed around and down my branch of Martin family, which is vaguely related to the Crisp family (William Crisp is apparently my Half Great Great Great Uncle! ), it turns out to be loaded with facts… albeit somewhat jumbled. There’s still a few loose ends – death certificates will, or newspaper articles might, reveal details of whether the measles story is true. The identity of Selina was also generation out, and the wrong bit of family went ‘up North’ – it was all in the story. For me, it proves that those little oral snippets, or those scribbled notes, are just as important as those official records. In fact, they are often more interesting. Using official records to help untangle these family stories is the trick…. regardless of how long you take to start work on them!